If you boldly volunteered to host Christmas dinner this year and are starting to feel your first nervous twinges, I have three words of advice: Brine your bird. Brining is your ticket to a juicy, full-flavored chicken, even if you’re not feeling totally confident about your roasting skills. Today, I’ll explain why this works and show you exactly what you need to do. This will be the best tasting, most juiciest chicken you will have ever made and tasted. Below you will see a collection of flavored brines to choose from. My favorite which I use often is the top link. Enjoy. If you have other brine recipes feel free to send them over and I will get them on the list too. 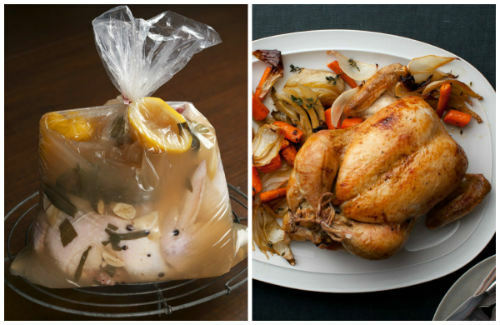 I think it is safe to say you will find a chicken brine recipe you and your family are going to love today. Depending on how you feel, you could choose from a citrus flavor, herb flavor and then a garlic flavor. All of the recipes are great, so test them out. These recipes will work for whole chickens, legs and wings and chicken breasts. Thanks for choosing us to get your recipe from. If you love it let us know back over on Facebook. We love hearing your stories and thoughts.